In the berry category, blackberries took the trophy, strawberries, cranberries, raspberries and blueberries (in that order) were all runners up. No doubt blackberries were humbled and honored to be nominated in such auspicious company, but let’s face it, they knew they had this one in the bag. Their bioflavonoid content contributes to their dark blue color, giving them a distinct advantage for the antioxidant win. Their talent is also evident in their excellent scores in fiber, Vitamin C and calorie content (62 calories per cup). Why is antioxidant content in food even important for us? Antioxidants are molecular protectors and great defenders of our well-being. Think of them as your own personal bodyguard! At the cellular level they help stop oxidation reactions that cause cell damage. Unbridled free radicals cause damaging oxidation reactions in our bodies by chemically, molecularly or cellularly altering the status quo. When an electron from a stable environment gets stolen by a free radical, this causes the need to go find another electron from somewhere else to replace it, resulting in a rob Peter to pay Paulâ€ damaging chain reaction. This is called oxidative stress. This can change the script of a bio-system, such as a cell wall, causing it to become unstable and perform poorly. Our bodies are bombarded by free radicals every day coming from physical stresses, environmental exposures, inflammation, radiation, smoke, poor diet, etc. A good diet — starring these antioxidant rich foods — will help with the prevention of diseases like cancer, dementia and heart disease as well as sight loss and the processes of aging. Hire these antioxidant bodyguards and they will help fend off those free radicals for you. 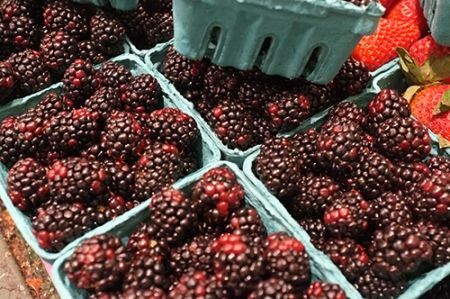 Delicious, juicy, versatile berries are ripe and ready for a fine performance this summer. You can enjoy these lovely delights sun-warmed off the vine or all dressed up, baked and beautiful. For inspiration, be sure to check out Chef Jeremy’s blog. Enjoy.